The Division of Student Affairs exists to help students succeed. This is our #1 goal. We work collaboratively across the university to engage students and provide programs to fit a variety of individual needs and strengths. From internships to initiatives aimed at helping underrepresented groups or exceptional students, Student Affairs strives to help all students succeed. The division measures and evaluates our programs and services, deriving empirical data to reveal what does, and what doesn’t work with various student populations. We use these measures to continue aiming toward and building an ever-improving university experience. Student Affairs also partners with employers and other community members for business development opportunities; local school districts to provide early outreach; and with on- and off-campus community leaders to help students understand the role of citizenship and community engagement. In addition, the division’s programs and services help provide international experiences for our students, acclimate and educate students from other nations, and educate students about cultural differences and competencies. Despite current budget difficulties, the Division of Student Affairs strives to sustain the quality programs and services that we know help students succeed. The university and the division will continue to seek creative ways to maintain these vital services now and in the future. Student Affairs supports the growth and academic success of all students to help them meet their highest educational aspirations. Student Affairs believes in promoting a campus climate that values, accepts, and learns from our rich diversity and fosters mutual respect. Student Affairs strives to develop leaders and expand opportunities for student involvement in campus, local, regional and international experiences. Student Affairs fosters a campus culture that encourages each student to articulate his or her own goals for a successful future. Student Affairs Division promotes the individual development and welfare of all students so that each student can thrive. Services include health and dental care, counseling, wellness programs, and much more. Student Affairs fosters an atmosphere of civility and mutual respect, encourages independent civic responsibility and core academic values, and promotes the individual development and welfare of all students. Student Affairs oversees the Residential Education Office and provides a variety of services to commuter students. We strive to enhance the living and learning environment for all students, both inside and outside the classroom. Welcome to SDSU! Your education and well-being are the top priorities for Student Affairs. 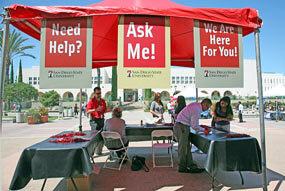 The Division of Student Affairs is a student-centered partner in the SDSU learning community. Education is enhanced, both inside and outside of the classroom, through quality support services and programs that advance student learning and development. The Division contributes to academic and personal success, encourages independent civic responsibility, and promotes the welfare of all students. Student Affairs helps connect students to the university and to their future, building alliances that foster retention and loyalty beyond graduation.